For the final presentation our group of myself, Sam Carl and Chris Rivalsky made two different models to show the model at different scales. First we made a small scale model of the entire construction, this was made out of four layers of museum board laser cut and then layers to make the system for our construction. Additionally we built a model of a piece of the construction at a larger scale to see how the construction process would work. This construction was made of two CNC cut pieces of plywood, with a fabric layer between the two. While we did not finalize the connection between the units we were thinking we would use some type of metal ring that would allow the units to move independently of each other in more than on direction. Our Group looked at the Unity Game engine and how it can be used in architecture. A game engine is used to make realistic environments for video games, in the case of Unity any console or handheld mobile system. The Unity Game engine, also called Unity 3D is most well known for the creation of the game Temple Run. Unity comes in two versions; the standard version is free while the pro version will cost $1,500. To build in Unity the user can either model their own spaces, or import a file from several compatible sources. Currently, the Unity Game Engine supports files from 3DS Max, Maya, Blender, and ZBrush. Several other formats are currently under development, however Unity has not said what formats these are. The rendering engine of the Unity Game Engine can render bump mapping reflection, parallax mapping, screen space ambient occlusion (SSAO), which is a way of calculation how light radiates off of an object, specifically off of non-reflective surfaces. The Unity Game Engine has its own built-in audio system in which sounds can be created and played in the 3D environment. The system contains its own animation system that allows for the population of the scene that the user creates. The Unity Game engine has some applications for today’s users, outside of simple real-timer rendering. The system has the potential to be used as an interactive web-based presentation model, that would allow for users to access a pre-built model and move through the system, having the possibility to change the environment in ways such as lighting and moving furniture. In addition the system can be populated with options that can change from one to another, for example the scene can be created with lights that can change from one model to another, that way the user can enter the scene and experience the space with one light, then change the light to the second type to compare the two. The Unity Game Engine can also be used for web-based spatial planning, as well as mobile platform-based augmented reality presentation methods. In this situation the user points a mobile devices such as an Ipad at a QR code on a surface. The system then will show the model on the surface, in addition the model is interactive, and so that the user can remove parts of the model so see inside the model. The user can visualize models and assemblies, as they would appear in space, and in real time to accept changes. The Unity Game Engine allow for interactive web-based model presentations. This allows for potential clients to see and interact with potential spaces from wherever they are. Things such as lighting and furniture cane be manipulated by users, with little knowledge of the program, with is good for users who have little experience with programs such as the Unity Game Engine. The system is flexible and does not require lots of space to run so it can be deployed quickly by almost anyone. There are several other game engine programs that run similarly to the Unity Game Engine. The first is the Unreal Engine 3DK, which is created by UDK. The Unreal Engine can run on systems such as the Xbox 360, Playstation 3, PC and Mac platforms. The engine is mostly geared towards the first and third person shooters, and its price is not available online, but is available upon request, as UDK usually determines price through royalties based on the success of the project. In an online ranking by Develop, the UDK Unreal Engine 3DK was ranked 1st in a ranking of the top ten game engines. The next competitor is the Torque 3D system. Similarly to the Unity Game Engine, Torque can run on a number of systems, both console and handheld. For computers the price is $1,000, or 4,000 for professionals, however a light version is available for the IPhone for only $500. This system was recently overhauled to match the Unity Game Engine and was ranked 10th in the same Develop poll. Finally is the Cry Engine 3, which can run on any type of console or computer system. There is no listed price, however one is available upon request. The system is known for its visuals and recently added support for the Xbox 360 and Playstation 3. In looking to what the future may hold for game engines such as the Unity Game Engine, there are several possibilities in which this system may be used in architecture. First would be the possibility to run simulations, such as Maya’s particle function, however instead of using simple spheres the game engine can populate a room with actual people. This would allow for designers to see how the space would feel with different amounts of people in a room. The game engine is also a powerful tool for rendering scenes in which there is either people or cars moving through, or showing a time-lapse video of a project or space. The game engine also could allow for users to move through a space, experiencing it from every angle. In the distant future I could see this type of simulation combining with a virtual reality simulator to allow for users to literally walk through a project and truly experiencing spaces before they are built. For my part of the group project I looked at the future possibilities of gaming engines such as the Unity Game Engine in architecture. In doing so I see several different possibilities for the game engine in the future. One possibility would be certain types of simulations to look at the capacity of spaces and their ability to hold expected crowds. This would be similar to the particle function in Maya, which can show similar simulations, but is not able to show people or vehicles moving through a space. One example of this would be simulating how a space looks at capacity and when it is below capacity. This could help a designer see how people are moving through the space and how it looks. The game engine would also allow for certain types of movement within a scene that could enhance the viewer’s experience. Things such as water moving, or people or cars moving through a scene could help a space feel more “real” for someone viewing a project. A scene could also switch from day to night over a period of time. Another role that the gaming engine could have assisting designers would be giving the designer an opportunity to move around inside a project. This way the building could be inspected from every angle along every step of a path. In today’s architectural programs it is very difficult to be able to see the entire building in such a way. By using a game engine the designers would be free to explore the entire building from different angles and perspectives that they may have missed in previous programming techniques. I feel, however, that the biggest opportunity for a game engine, such as the Unity Game Engine, in the future would be to allow for clients and users the opportunity to experience the project. Since not all clients can imagine a space from elevations, sections, and plans, having the opportunity to take a controller and move through a building in 3-D could help them understand how the space would look and feel once inside. Finally in a more distant future the game engine could be combined with some type of virtual reality simulator to give the view the real opportunity to move through the project. This approach would give an unprecedented experience of reality in a project. The experience would allow for both users and designers to move through a realistic version of the project and get a feel for what it would be like to move through a building. While most of these ideas are in the future one similar situation is occurring in Autodesk 3DX Max in which they are close to having a system which would allow for users to model people or objects moving through a scene by drawing a path, and then the objects will move along the path when a scene is created. This represents the first step along the path in which gaming engine technology is merged with architectural programming. The Salvartor Car Park is a parking garage located in Munich Germany. The existing garage was completed in 1964, with two floors planned to be added. Peter Haimerel Architecktur used computer programs to generate the pattern used for the new façade. 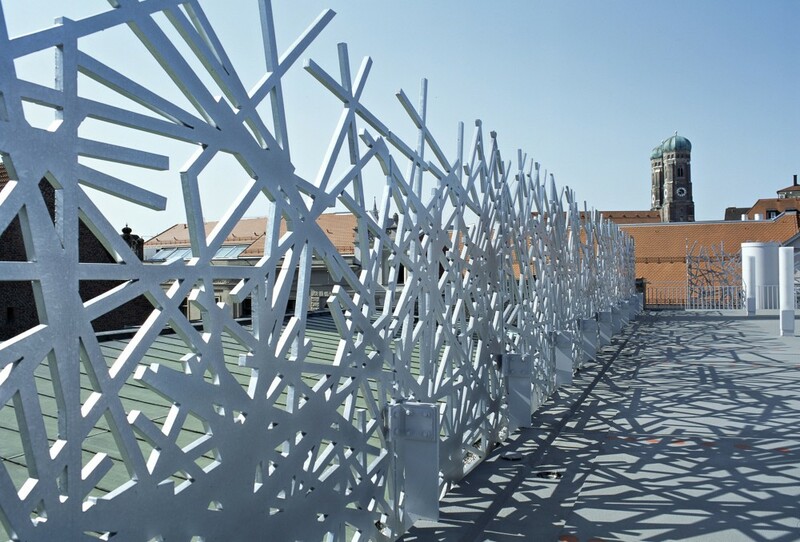 The netlike structure comes from over 20,000 sticks that are each 5 feet long. The forms are then cut from a computer controlled plasma cutter, which allows the whole process to be completed on the computer, which no paper involved in the progress. The overall density is heaviest at the bottom and becomes thinner towards the top, simulating a transition from the heavy brick to the sky above. 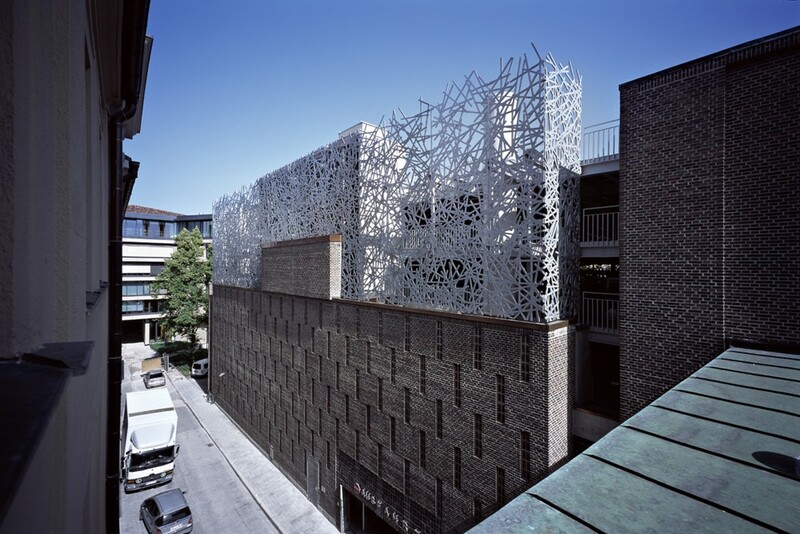 The main reason for the façade treatment is that the parking garage is in a very historic district of Munich and the added two floors puts the garage high enough to be in view of several historic sights within the city, in addition the garage sits on the former city walls, so it is actually protected as well.